Property 1: GORGEOUS SEA & MOUNTAIN VIEWS. NEAR TOWN & BEACHES! FULLY FURNISHED 2 BR CONDO! Property 2: 2 Bedroom, 1 bath one block to the best beach and a short walk to the Malecon. Property 4: NEAR TOWN & BEACHES! SPACIOUS, 2 BR FULLY FURNISHED CONDO #302, WIFI, MT. VIEWS! Property 6: NEAR ALL, SPACIOUS 2 BR CONDO # 301 FULLY FURNISHED, WIFI, SEA & MOUNTAIN VIEWS! Property 7: Huge Family? 5 bedroom sleeps 16 with private pool home!! Property 8: El Dorado Ranch Resort Ac,Golf,Pools,Wifi,PrivBeach Sleeps 6 plus kids under 14. Property 17: Tranquil Home With Beautiful Views In The Safety Of El Dorado Ranch Community. Property 18: Villa Baja Vista at Playa de Oro - 900 Feet to the Beach! Beach Front Luxury High Rise Condo, Playa Del Paraiso! Property 20: Beach Front Luxury High Rise Condo, Playa Del Paraiso! Playa del Paraiso Condo #504 Breathtaking view!! 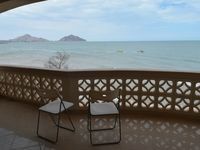 Property 37: Playa del Paraiso Condo #504 Breathtaking view!! Property 39: The Hidden Teasure of BC Mexico, safe, quite, relaxing, warm waters. Property 43: Downtown condo 5, Peaceful area! Luxurious 3 Story Home On The Beach Sleeps 15 With Private Pool and Wifi. Property 49: Luxurious 3 Story Home On The Beach Sleeps 15 With Private Pool and Wifi. Property 50: Casa Fuego....Enjoy and Explore! !